The reason behind Terrence McNally's A Perfect Ganesh being so rarely performed is not its now-outdated fantasy of India, but that its story's narrator and facilitator is the Hindu deity Ganesha, remover of obstacles and, thus, patron of lovers and travelers. Why should so benevolent a spiritual icon present problems? Ganesha, you see, boasts a human body distinguished by multiple upper limbs and an elephant's head, complete with fan-shaped ears and elongated proboscis—facial characteristics with the potential to hamper both the visual and aural expressiveness of the actor cast as McNally's congenial ambassador—in this case, Michael Harris. "The usual concept with this show has been to encase the performer's whole head in the elephant mask." observe costume co-designers Rachel Lambert and Zachary Alexander, "We felt it was important for the audience to connect with Michael's face—his eyes, at least. So after looking at many different images of Ganesha, we decided to highlight the artifice—covering him with gold filigree and traditional Indian jewelry befitting a divine being, but transparent enough for us to see through it." The foundation for the final mask is a cap, molded to Harris' head, made of a heat-pliable substance called Fosshape, with a variety of delicate fabrics, jewels and wire affixed to it. ("The wire for the trunk originally came from a washing machine.") The goal, according to Lambert and Alexander, was to keep it lightweight and balanced, lest a sudden movement topple it off its wearer's head, or a stray elbow send it spinning into the corners of the stage. More experimentation was required to provide Ganesha his extra arms. "Our research showed every representation of Ganesha displaying four arms," explains Lambert, "but we couldn't find evidence of any play doing it before." Adds Alexander, "The arms themselves are from a mannequin. They are attached to a harness that Michael wears on his back, with the arms dangling loose on short chains from his own arms, so that they move fluidly and gracefully, while staying out of the way." It wasn't enough to simply build a set of prosthetic devices, though. Harris recalls receiving "bare-bones versions" of the mask and arms during the second week of rehearsal, "so that I could start familiarizing myself with them as soon as possible. What I have to remember is to act with my whole body, every minute—there are no casual gestures for Ganesha, however small. As time went on, more and more pieces were added, which meant that everybody who interacts with him had to learn how to navigate his physical dimensions, so we wouldn't snag on each other, or tangle, or become dazzled by the shiny ornaments." Lambert and Alexander attribute the success of their design to the entire company—director Steven Fedoruk, choreographer Ellyzabeth Adler, actors and technical staff—all working together from the very beginning. "This was a true collaboration," they declare, to which Harris concurs, "What I am wearing is a work of art, viewed in motion." 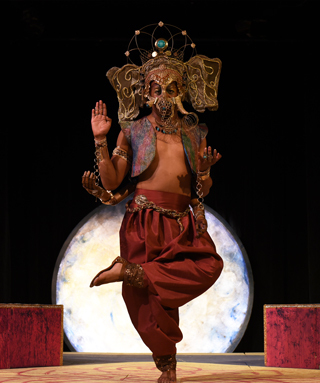 A Perfect Ganesh runs at the Athenaeum Theatre through August 23.